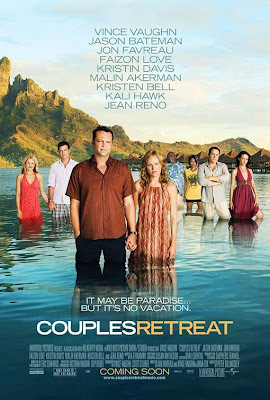 So, the other day when it was snowing like crazy here in New York, we decided to watch the movie Couples Retreat. I have to say I thought I was going to be totally disappointed and bored, but it was actually sort of cute and funny! The real point of my story is that I was completely enamored with the beautiful resort where they stayed in the movie and had to find of where it was. 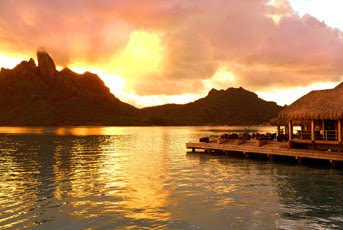 Well, I did...it's the St. Regis Resort in Bora Bora, in the French Polynesian Islands! Oh my goodness, if you've seen the movie then you know what I'm talking about, and if you haven't then I suggest you rent it. Like me, you'll want to be planning your next trip here too! 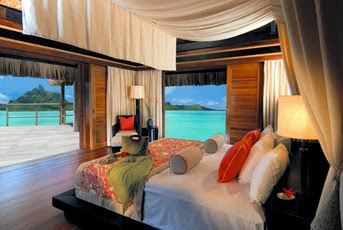 You can rent one of their Royal Over the Water Villas with a Private Pool... This is what the inside of your room looks like, and what you could wake up to every morning... And this what what you'll see as you are having dinner each night... The rooms start at $500 per night and can go up to more than $1000, depending on what you choose and when you decide to go. The rainy season is from November through April, and the peak tourist season when you have the best weather is from May through October. 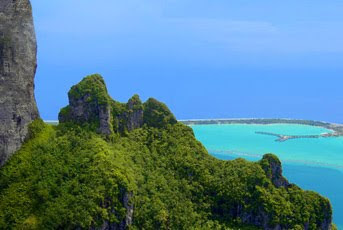 It's not easy getting to Bora Bora either, you must fly to Papeete in Tahiti first, and then either take a chartered plane, helicopter or boat to the island of Bora Bora. What a journey, but how worth it? 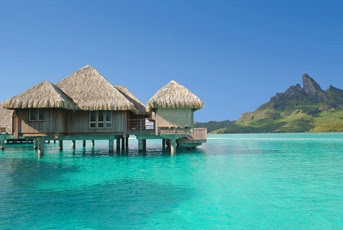 This could be a honeymoon destination for sure! Hi, ur blog is really nice & eyecatching, while reading ur blog I truly like it. I just wanna suggest that u should go for blog advertising & marketing there is a site which is offering very unique features at affordable prices there are expert advertising team who will promote ur blog & affiliate ads through all over the networks which will definitely boost ur traffic & readers. Finally I have bookmarked ur blog & also shared this blog to my friends.. i think my friend might too like it hope u have a wonderful day & ! !happy blogging!!. Thanks for reading & following Jet Set Smart Claudia! And thank you as well for the info on blog marketing and advertising. I will certainly look into it. In the meantime, please keep up with Jet Set Smart, and please become a follower on the bottom right hand side of the page. Also, let me know if you are thinking about travel anywhere as I can help you plan your trip.